Should we shake hands during the church service? Recently, I’ve come across a couple of suggestions that churches discontinue the long-standing practice of a hand-shaking and greeting time during regular services. I’ve heard several reasons presented for stopping the practice: 1) It makes visitors uncomfortable. When a stranger comes to the service and they have 50 people want to shake their hand in 5 minutes, it can be really disconcerting. 2) It spreads germs. People, especially in the winter, are very conscious about touching someone else’s hand during flu and cold season. 3) It takes up too much time in the service. The service is already long enough and that 3-5 minutes of extra time is extraneous. I’m of the belief that churches should have a greeting time during the service. There are several reasons which I’ll briefly explain. First, the concern over the comfort level of visitors comes from an extra-bibilical philosophy regarding the very purpose of the church. My doctoral dissertation explored the growth of the 1st century churches in the book of Acts and so I have personally spent a massive amount of time studying the Biblical purpose of the church, not only in the historical descriptions of Acts, but the explicit prescriptions in the epistles. As concisely as possible, the purpose of the church gathering is for the spiritual edifying and practical equipping of believers in Christ for the glory of God (Ephesians 3:14-21, etc.). The “Great Commission” was the instruction to go into the world to proclaim Christ, it was not a “great invitation” to the world to come into our assembly. The chronology is that a person trusts Christ by faith, and then they are added to the church. There are exceptions, such as in 1st Corinthians 14:23 or when the children of believers grow up in the church, but the general rule is that the church assembly is the place where believers are equipped for the work of the ministry. The basic design is that evangelism takes place outside of the church walls and edification takes place inside the church walls. Our goal is not to make the church gathering more comfortable for unbelievers, our job is to take the good news of the gospel to them. Once they have received Christ, the fellowship of the church will be the next step, beginning with public identification through immersion. I’m not saying that we shouldn’t care about the feelings of visitors to our services, but I am saying that we should not let the church growth philosophy eliminate practices which actually have their foundation in Scriptural principles. 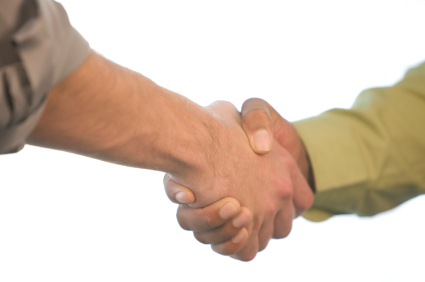 If it can be proven that a hand-shaking and greeting time is Biblical and beneficial to believers, it should be practiced, even if it is a little uncomfortable for visitors. Second, a physical greeting among believers, is a Biblical mandate. Culturally, we have moved from the practice of an “holy kiss” to a handshake; the particulars of its usage are certainly open to various applications. However, on several occasions, the apostle Paul instructed believers to greet or salute one another with an holy kiss (this was the ancient practice of a loose hug or the gripping of the other’s shoulders while touching cheeks). To the believers in Rome he commanded it (Romans 16:16); both of his epistles to the Corinthians hold such a command (1st Corinthians 16:20; 2nd Corinthians 13:12), as does the first epistle to the Thessalonian believers (1st Thessalonians 5:26). The apostle Peter also gave this instruction to the scattered Jewish believers to whom he was writing (1st Peter 5:14). The nature of this physical kiss (greeting) was described by Paul as being holy or sacred; it was called the kiss of charity or love by Peter. Intrinsically, it was spiritual. Third, there is incalculable pastoral value to a physical greeting. When I grasp the hand of each of the people in our assembly, it is similar to the practice of the ancient shepherd that would touch the sheep with his rod as they passed into the fold (God used this illustration in Ezekiel 20:37; Jeremiah 33:13). We are a small church of 50-60 on a given Sunday, but I still make it a point to shake the hand of each person who is there during our services. I know if there is someone who is absent, I’m able to look each person in the eye and greet them individually, I can usually tell if someone’s demeanor is joyful or discouraged, often someone will mention a prayer request to me – the personal benefits for me in our greeting time are varied. There was even a time when the refusal of someone to shake my hand indicated very clearly that there was approaching conflict which would need to be addressed. Fourth, the benefit of the physical contact between believers is tangible. The same things that I mentioned as they related to the pastor are true between individuals. They recognize among themselves who is absent and who is present, they can sense the happiness or sadness in one another, they can smile and encourage one another with genuine eye contact. It is a time which either strengthens relationships, ministers grace, or reveals a fracture which needs to be healed (it is difficult to sincerely look someone in the eye and shake their hand if you are at odds with them). An intentional time of greeting produces interaction that may not happen if people only communed when they happened to bump into each other. Frankly, I’m convinced that it is an activity of a healthy church and preserves a healthy spirit of mutual love and care. Fifth, a purposeful time of greeting is a strong deterrent to ethnic, social, class and gender divides. James specifically warned of claiming to posses faith in Christ and at the same time maintain a biased partiality towards others. The book of Ephesians reveals how God formed the church from two groups with an historically strong animus. Jews and Gentiles who received Christ were formed into one new and unified entity, the church. A strong church is a group of diverse people joined together in Christ. A scheduled corporate mingling and greeting makes partiality difficult to maintain. Sixth, it helps merge and weld generations. I love to shake the hands of the little children. I’m encouraged to see the mature adults lean down and greet the young children, or to address the teens as a brother or sister in Christ. Again, an incidental occurrence does not produce this same camaraderie. Furthermore, without the scheduling of it, it probably wouldn’t happen. Finally, a few thoughts regarding the concern of seasonal sickness or the idea that it requires too much time. We have sanitizer available for those who feel they should use it. There are also people who will refrain from the actual physical contact if they are sick or fear getting sick. Regardless, they do not refrain from the fellowship, they will still face each other and greet each other in the same manner as if they were actually shaking hands. Regarding the additional time in the service, the value of the interaction is worth the time it adds to the meeting. There are other things I would eliminate (like the announcements) before I eliminated the greeting time. The more I meditate on this practice, the more I see it’s value. I encourage pastors and churches to give careful consideration to this activity, which I’m persuaded has a Biblical foundation and will be facilitating greater communion of the believers in the church. Blest be the tie that binds/our hearts in Christian love!/The fellowship of kindred minds/is like to that above. Before our Father’s throne/we pour our ardent prayers;/our fears, our hopes, our aims are one,/our comforts and our cares. We share our mutual woes,/our mutual burdens bear;/and often for each other flows/the sympathizing tear. When we asunder part/it gives us inward pain;/but we shall still be joined in heart,/and hope to meet again.